Clear Quartz, pure silicon dioxide, is also called Rock Crystal or Ice Crystal, from the Greek word "krystallos", meaning "ice", because crystal was believed to be water frozen so hard it could never thaw. 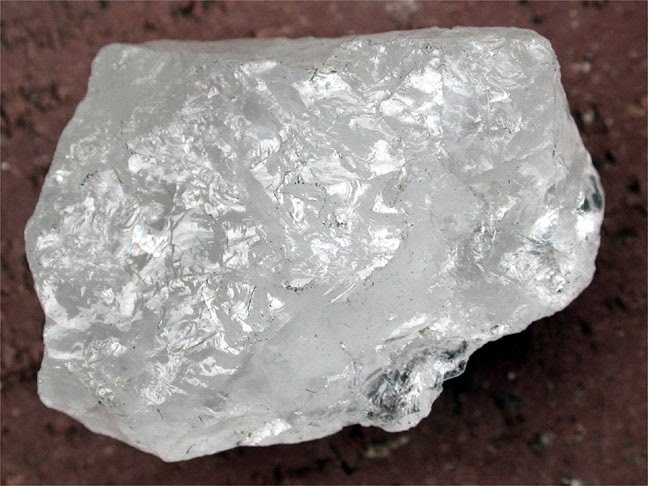 The prismatic hexagonal crystals have relatively smooth sides and naturally faceted terminations at one or both ends, and may be transparent as glass, milky or striated, often found in clusters and ranging in all sizes. The terminations have different facet shapes depending on the rate at which they were formed, and these shapes are deeply significant. 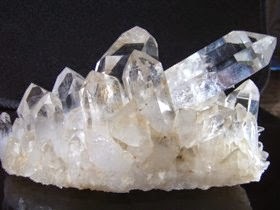 The same properties of energy amplification, programming and memory also make Clear Quartz the most versatile and multidimensional stone in the mineral kingdom for healing, meditation, expansion of consciousness, communication with guides, past-life recall, attracting love or prosperity, or virtually any purpose. However, with this power comes responsibility. To benefit from Rock Crystal's blessings, one must feel in harmony with it and deserve its gifts. Intent other than for good inevitably brings harm back on oneself. Crystals are professional support stones for artists, stylists, doctors and healers, inventors, musicians, and those who work in media. As an energy saver, Clear Quartz attached to the fuel line in a car is reputed to reduce fuel consumption. Like humans, each Clear Quartz crystal is unique, each with its own personality, lessons, and experiences. The crystals attracted into one's life are stones that will in some way help facilitate personal growth and awareness. They may work subliminally in unawakened minds, but for those spiritually attuned to the universe Quartz crystals are like beacons of light and positive energy to be used in daily thoughts, feelings, words and actions and integrated onto the earth. As a connection between the physical dimension and the spiritual, Clear Quartz enhances communication with plants, animals, minerals, and in speaking with and receiving information from the Divine and other-worldly masters, teachers and healers. Its natural tendency is for harmony and brings a sense of purpose to those who resonate with it. Used in meditation, especially when placed at the Third Eye, Clear Quartz filters out distractions and helps to empty the mind. It allows for a feeling of "oneness" and provides for a deep meditative state.